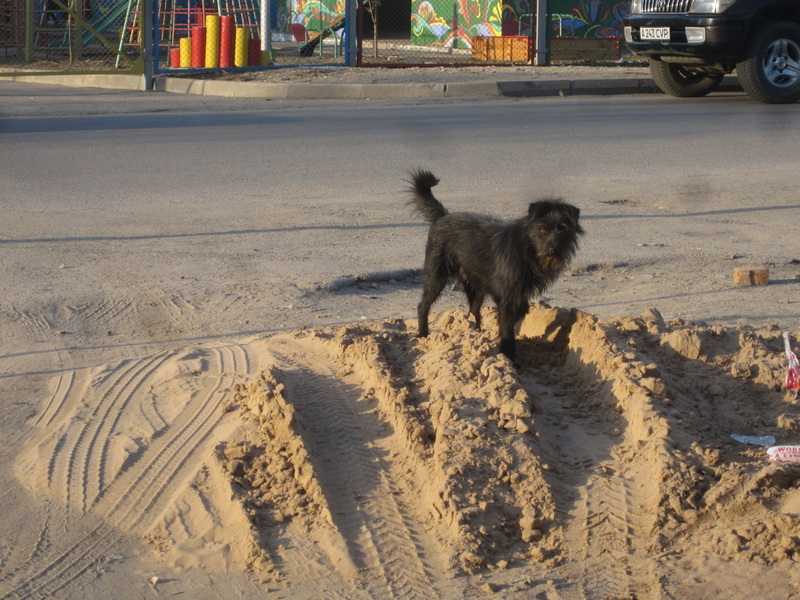 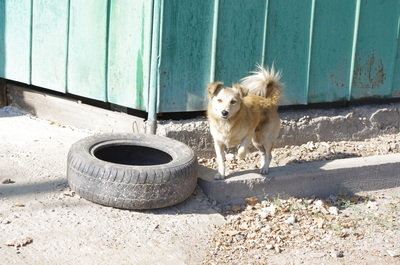 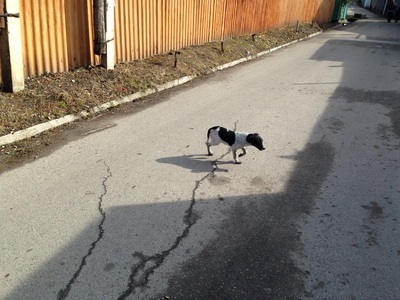 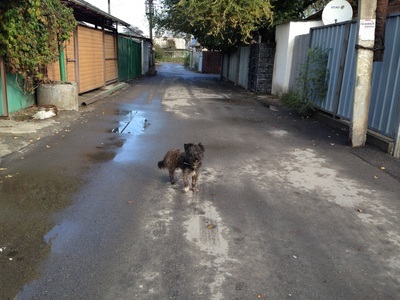 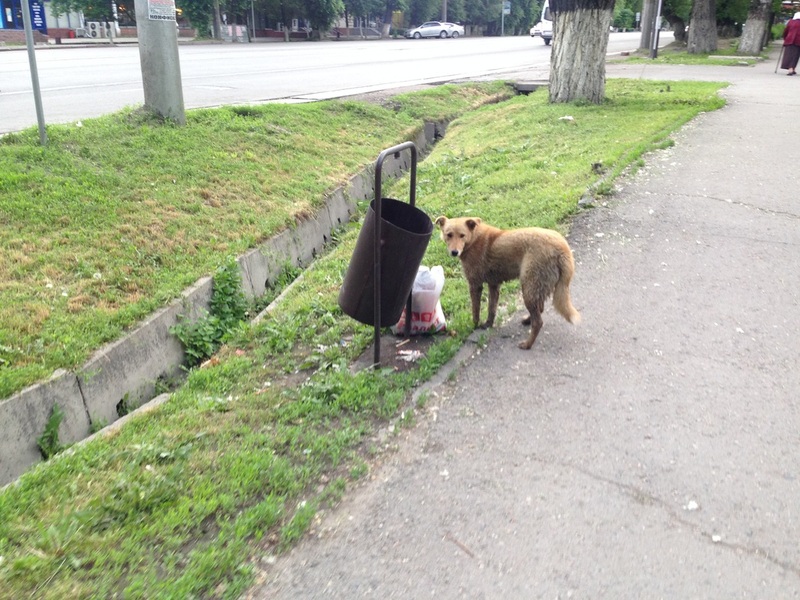 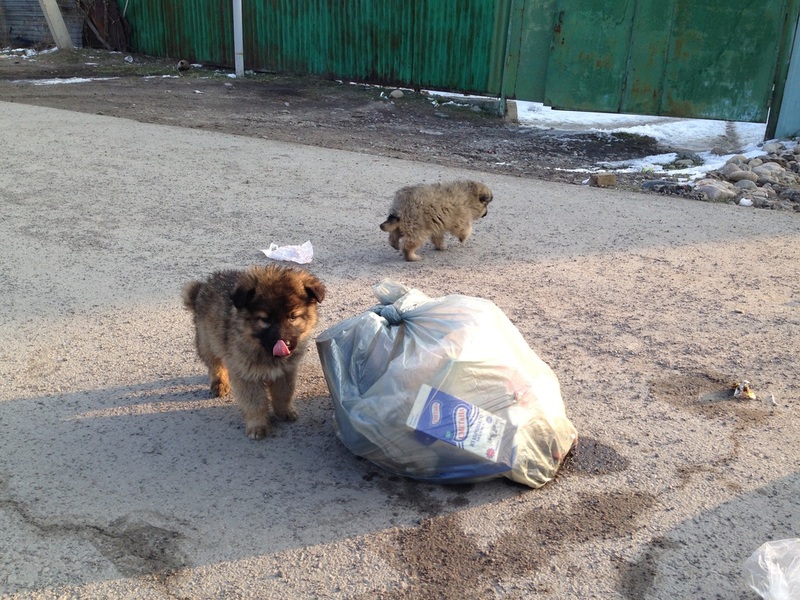 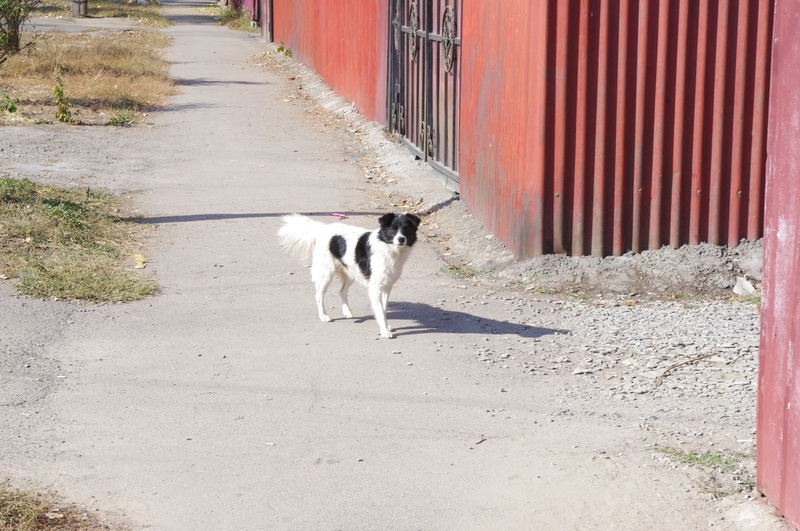 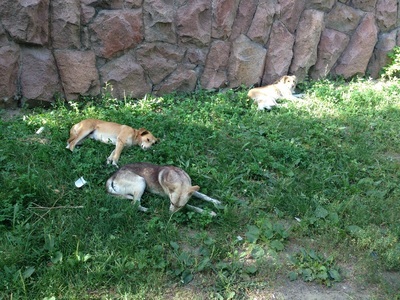 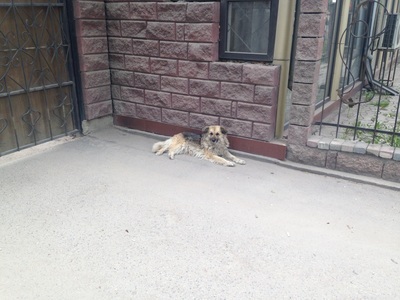 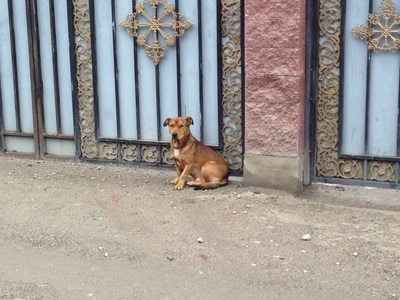 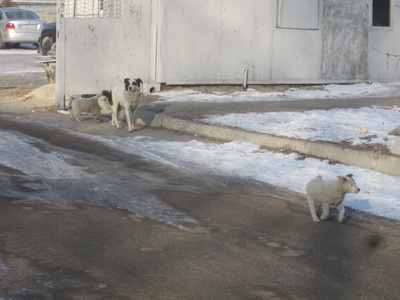 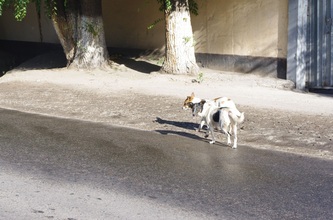 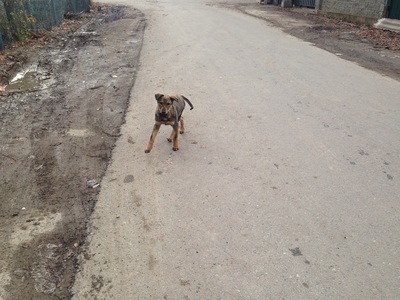 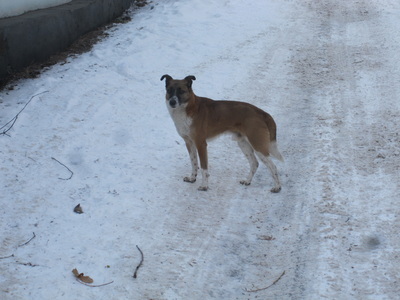 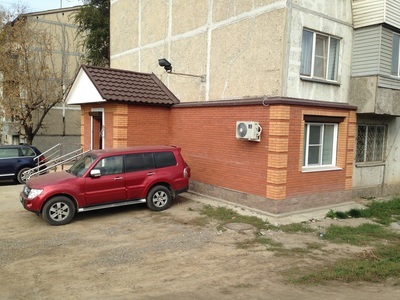 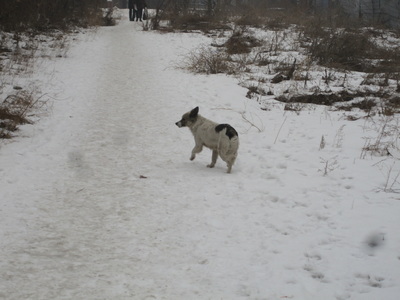 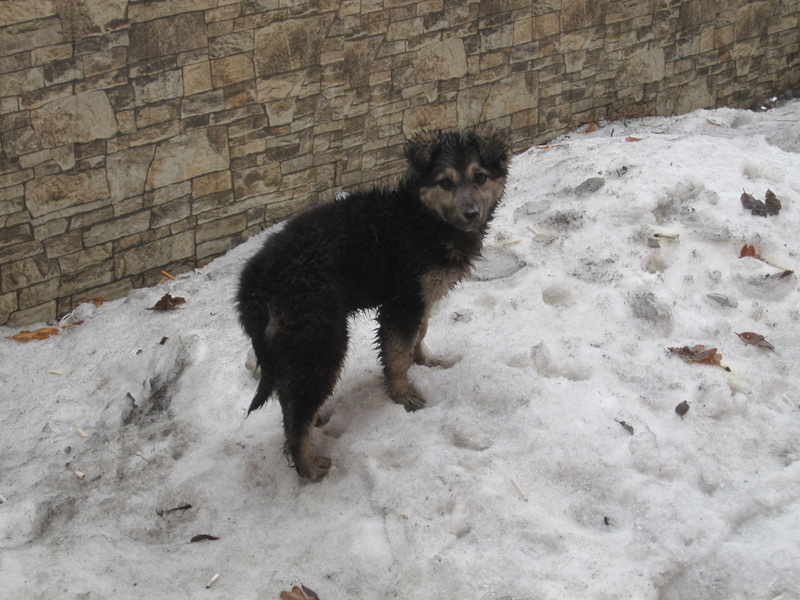 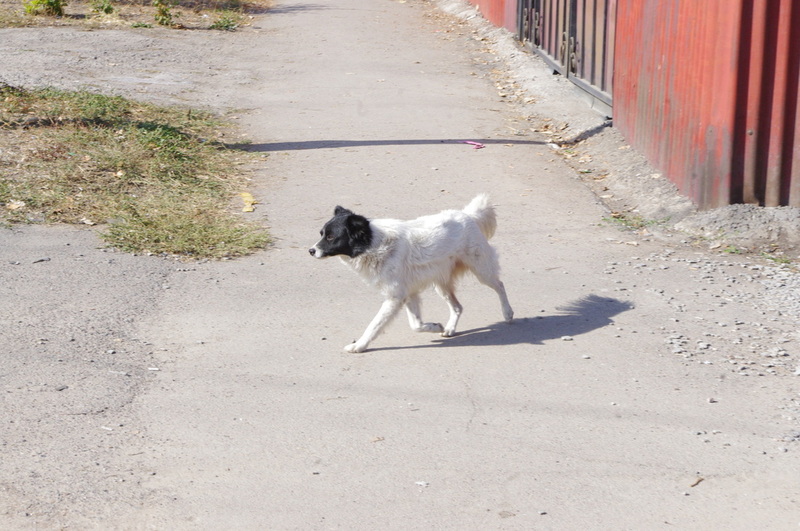 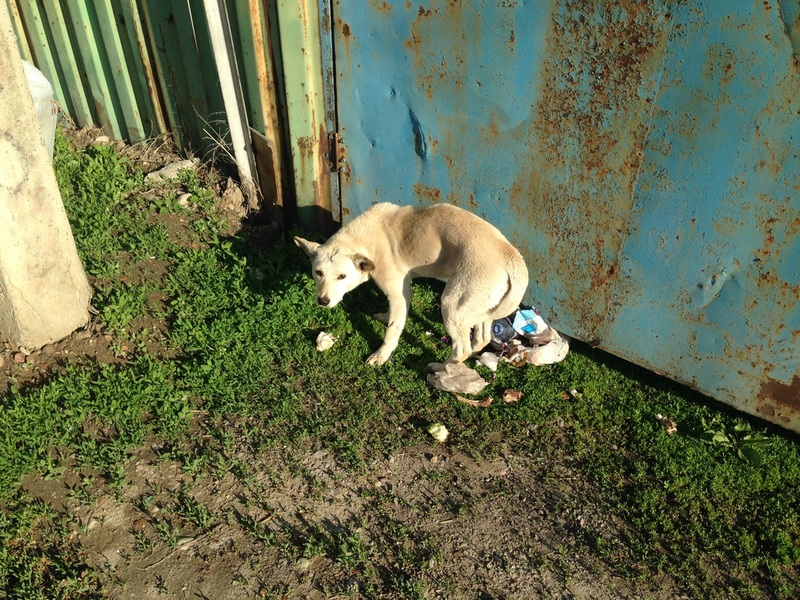 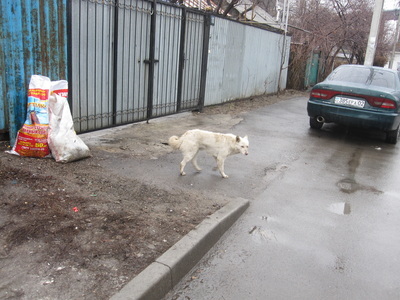 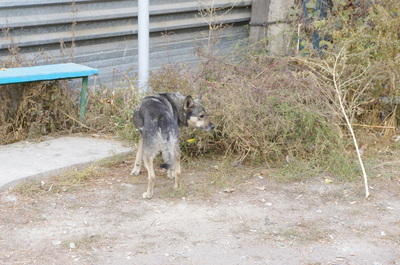 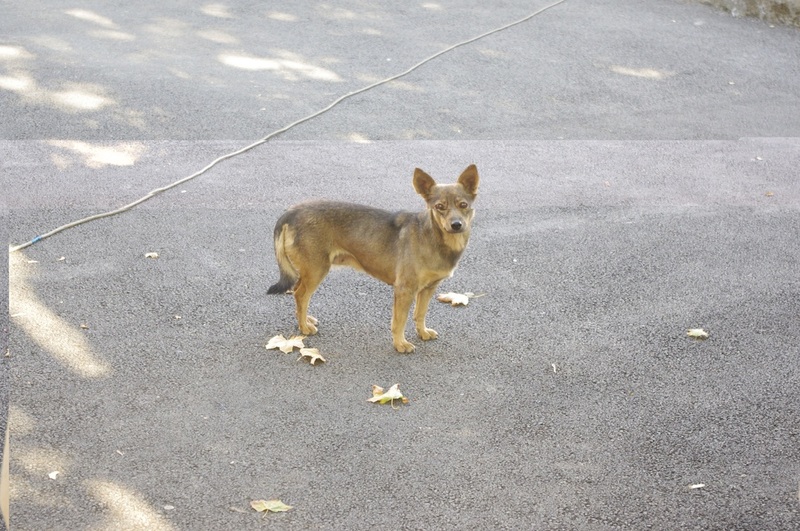 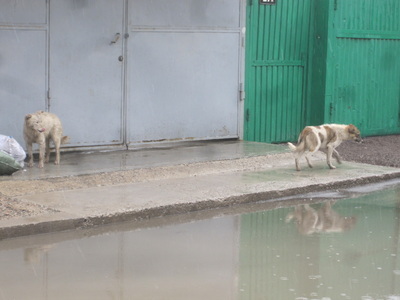 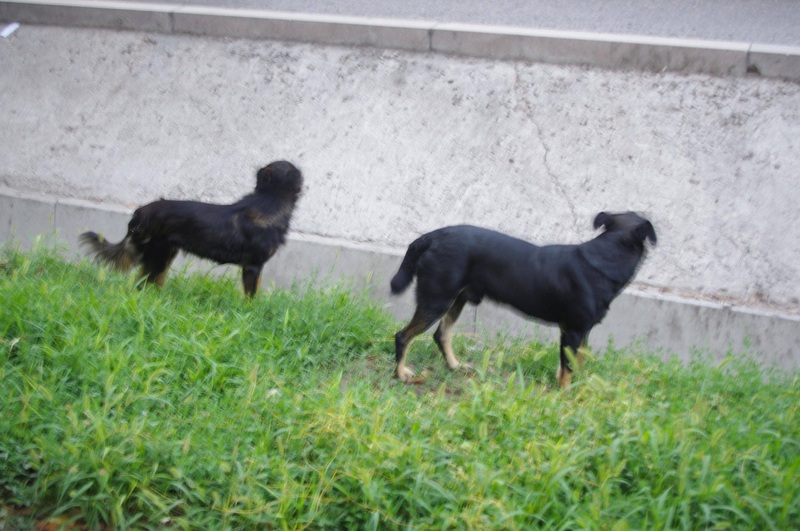 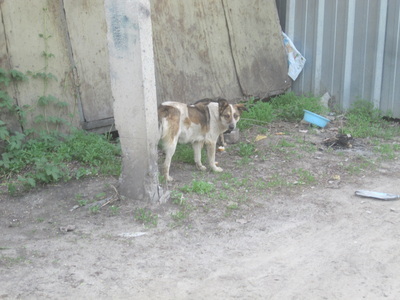 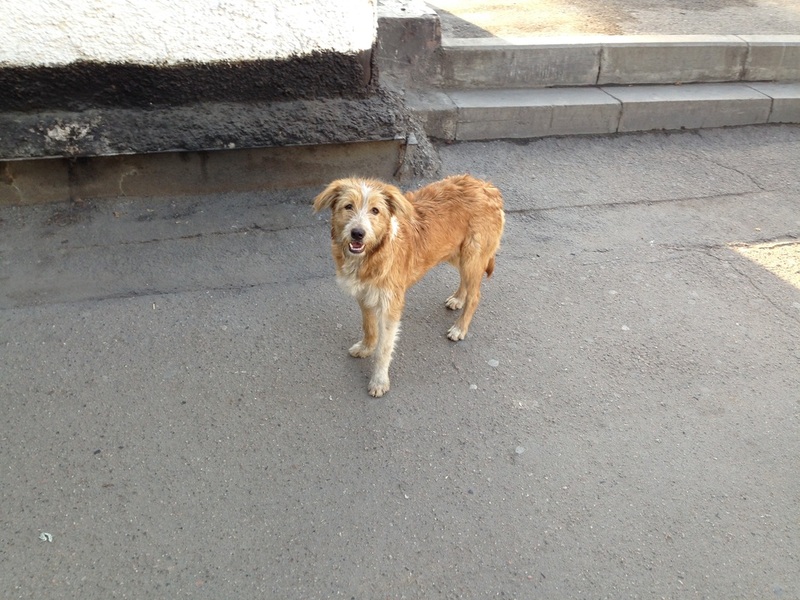 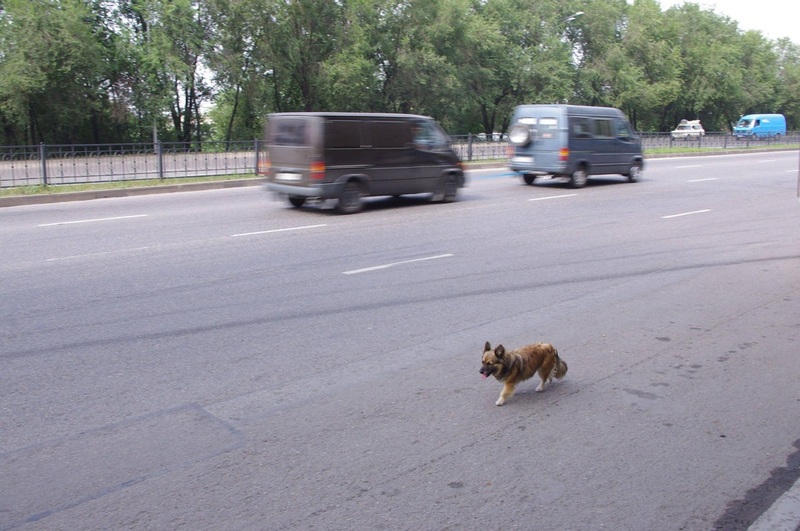 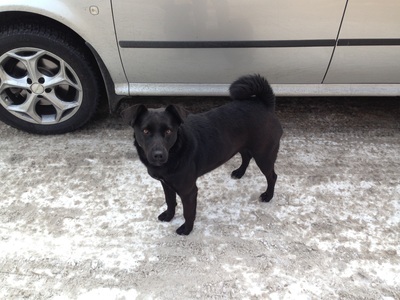 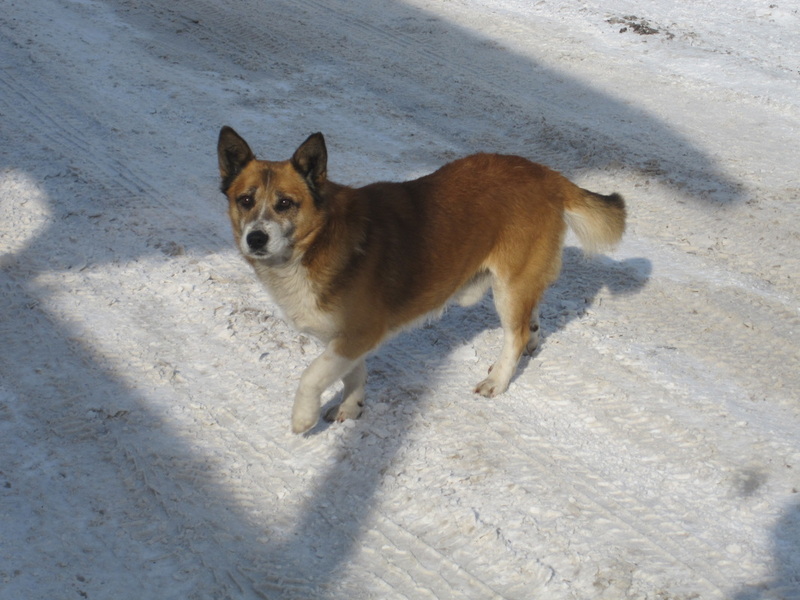 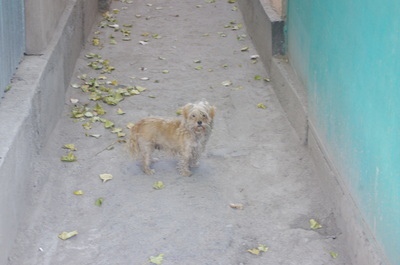 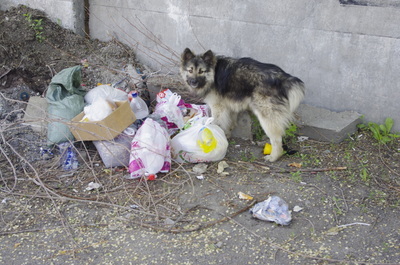 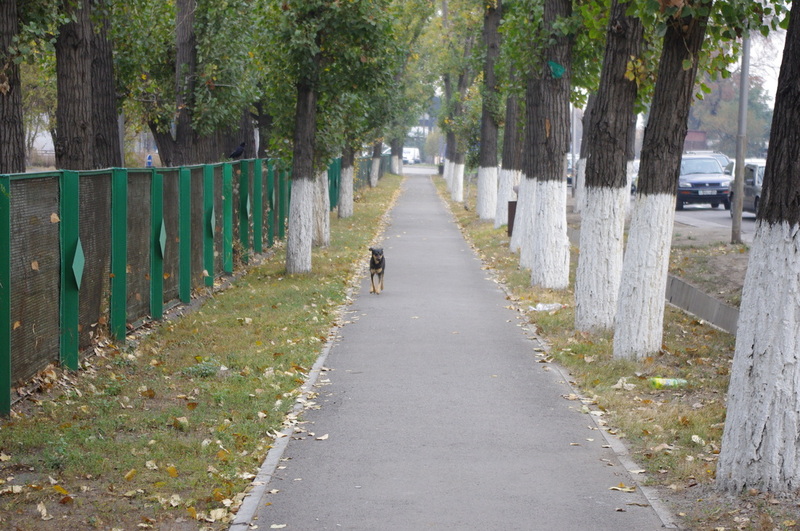 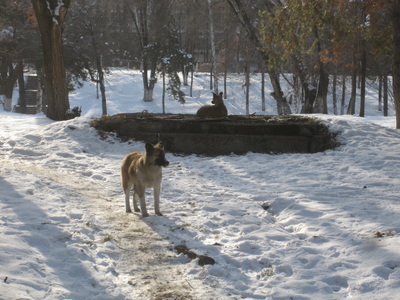 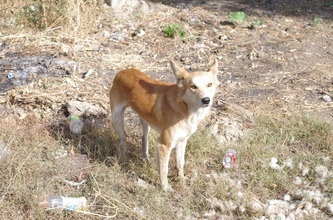 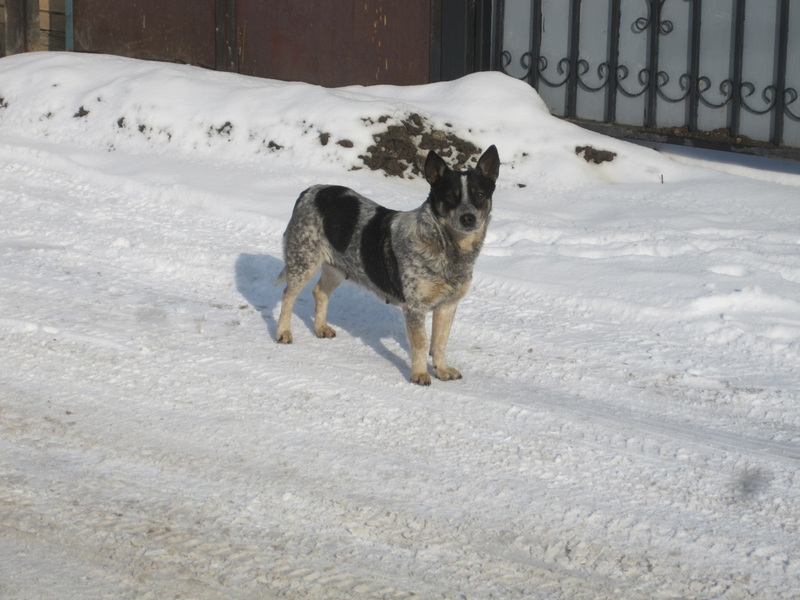 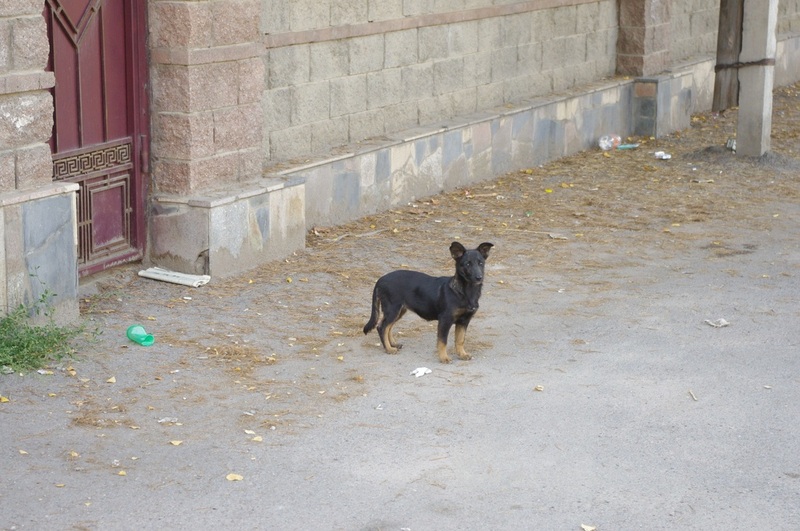 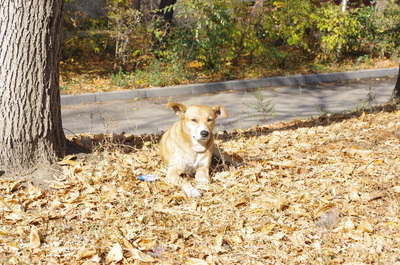 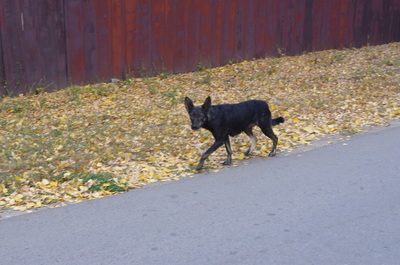 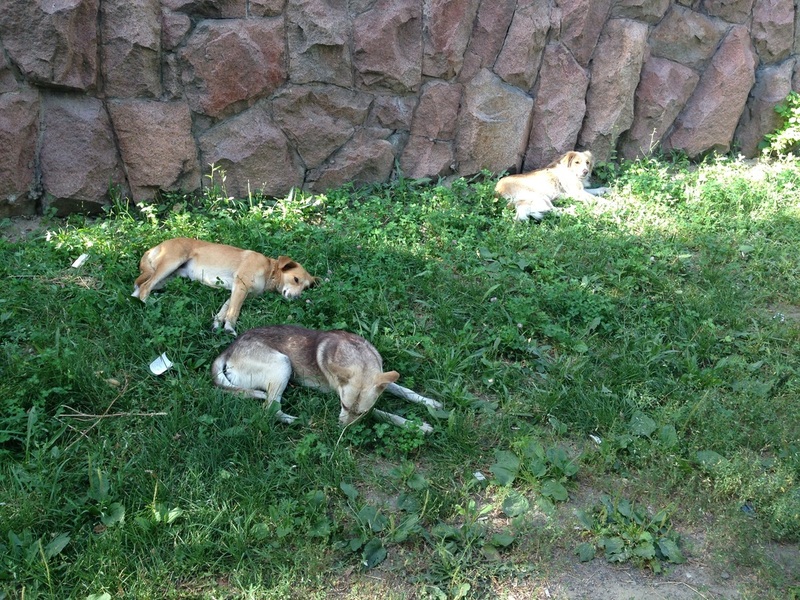 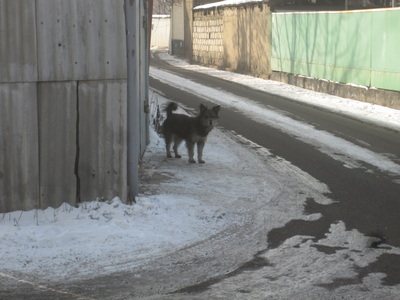 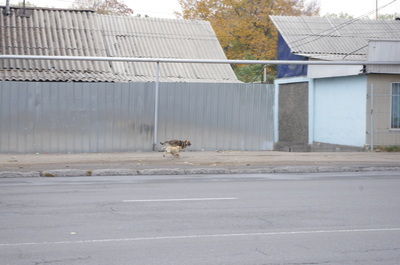 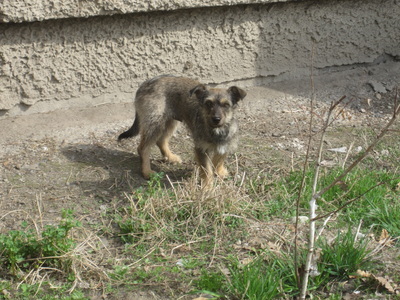 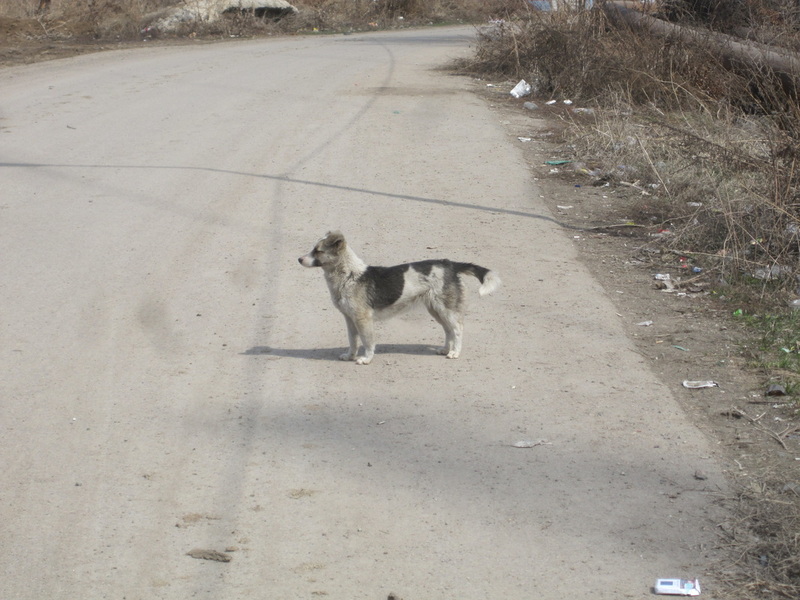 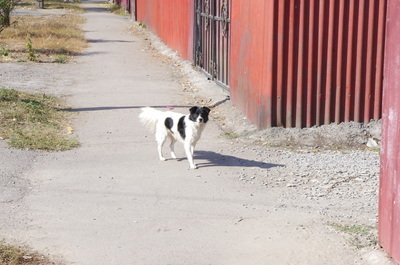 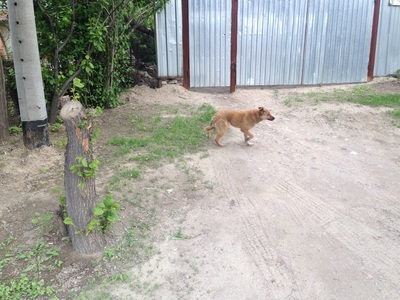 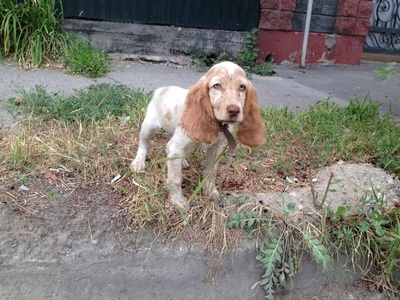 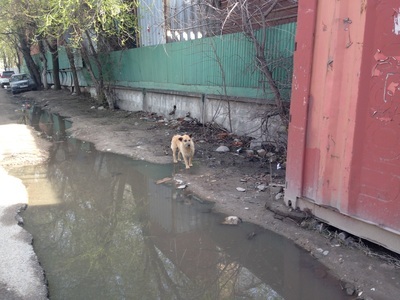 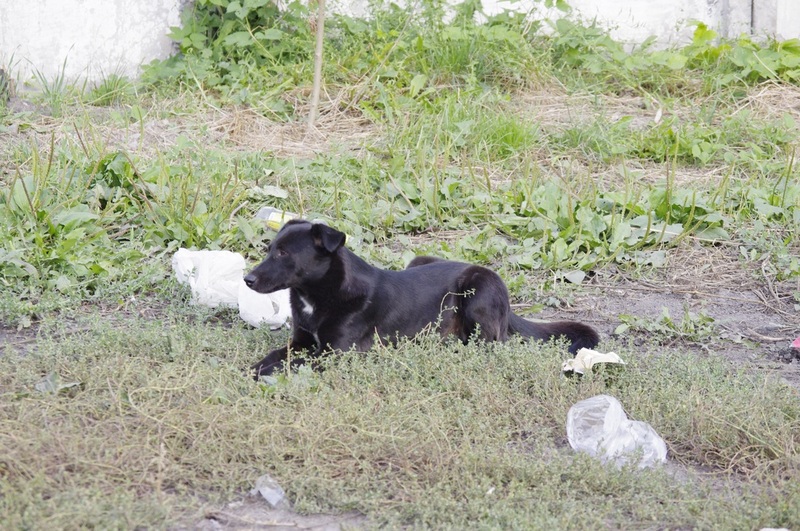 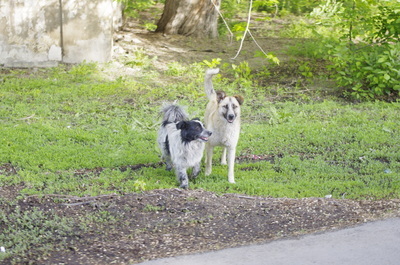 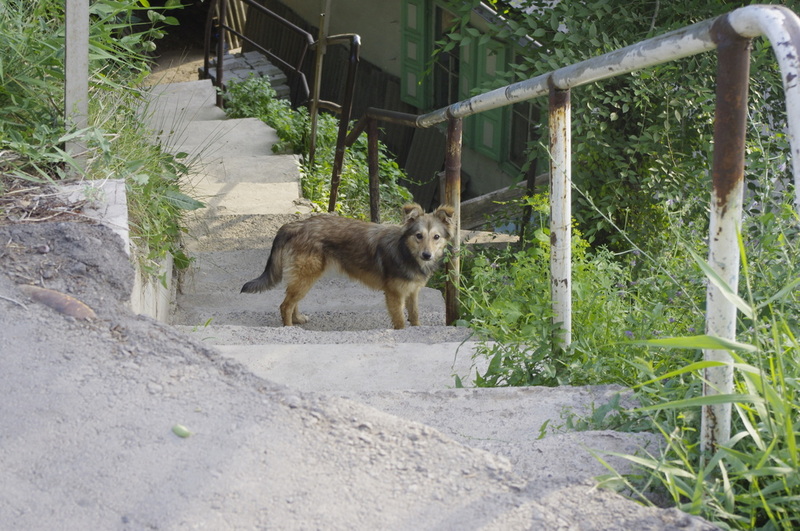 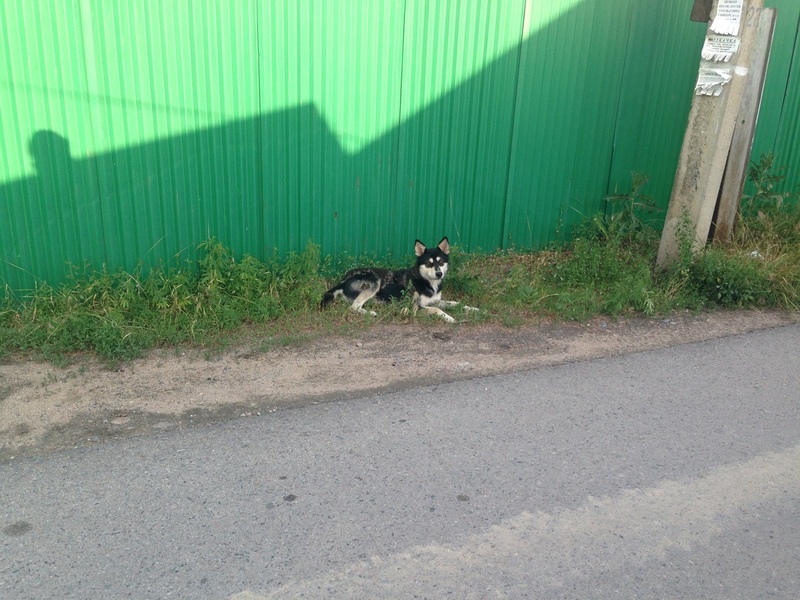 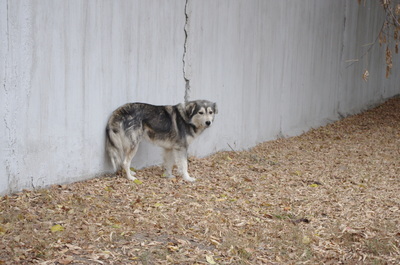 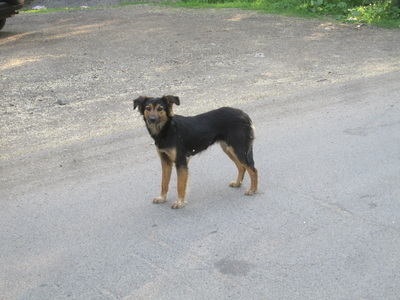 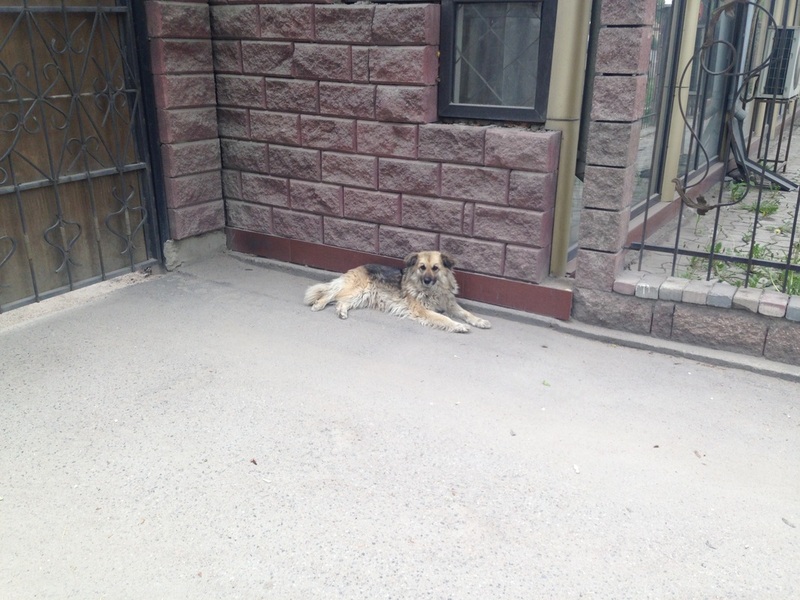 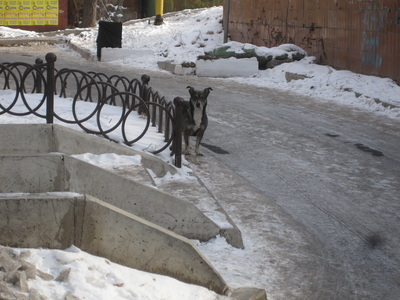 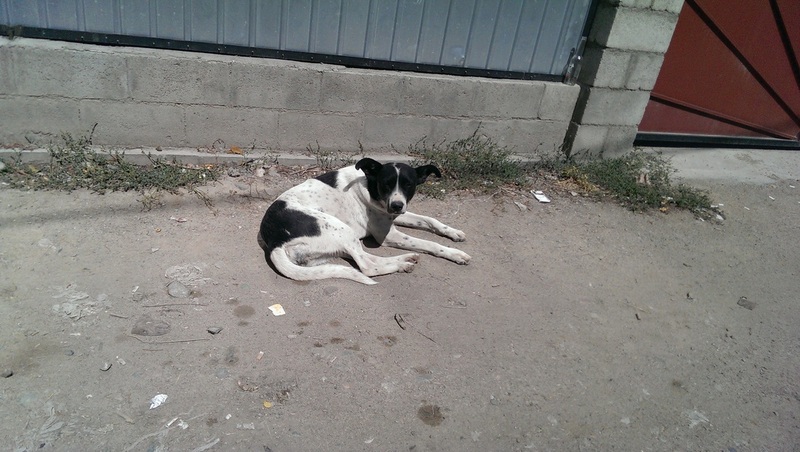 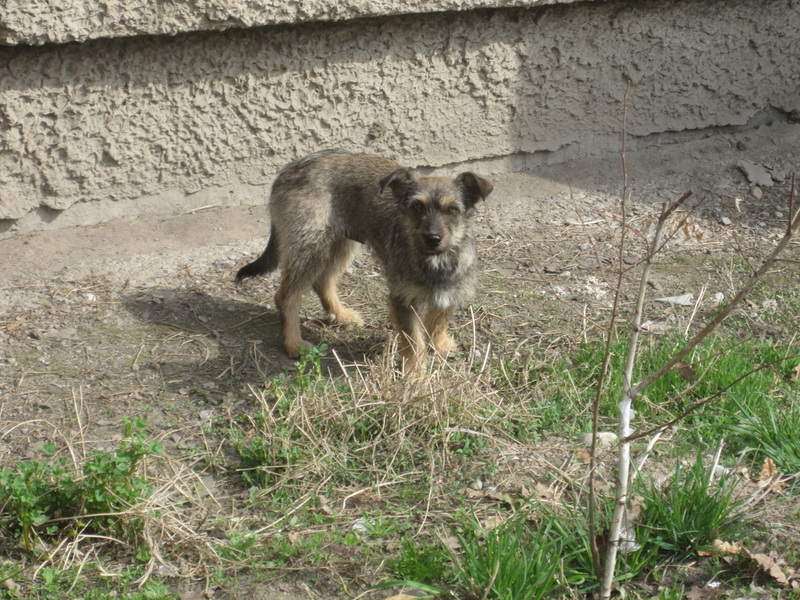 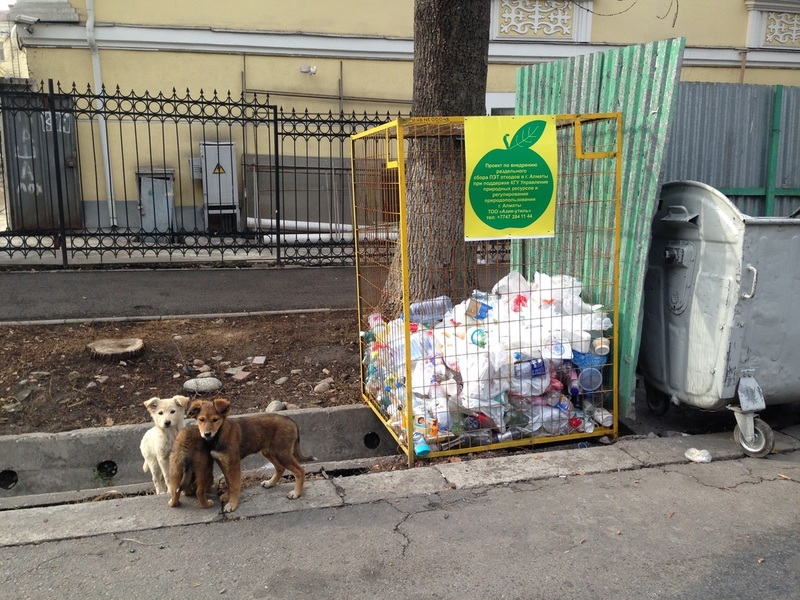 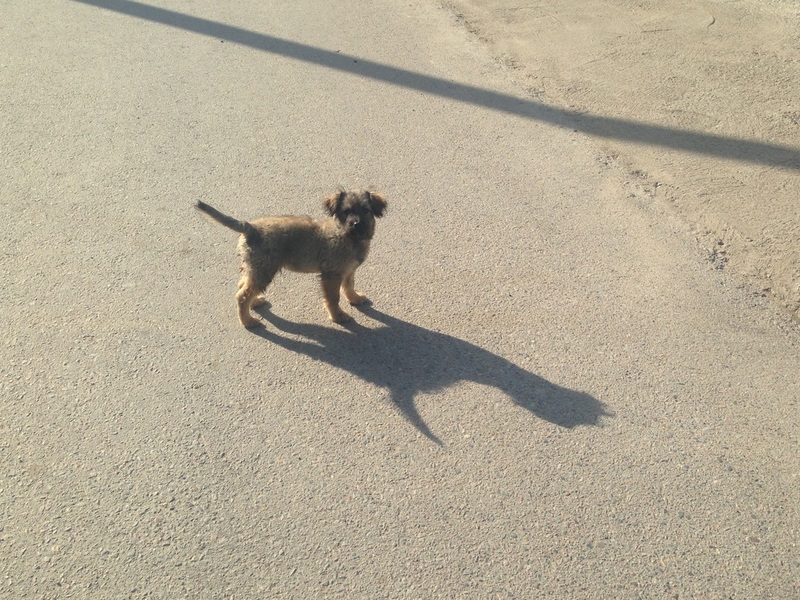 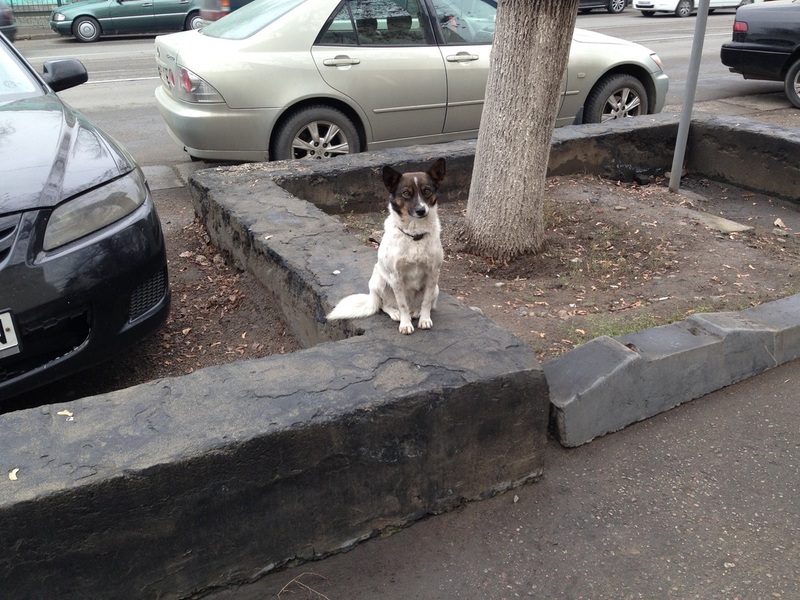 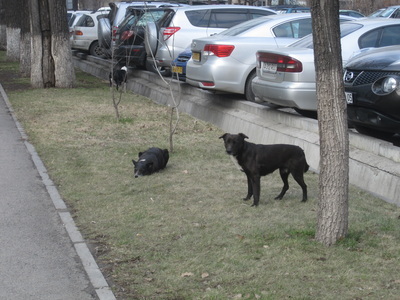 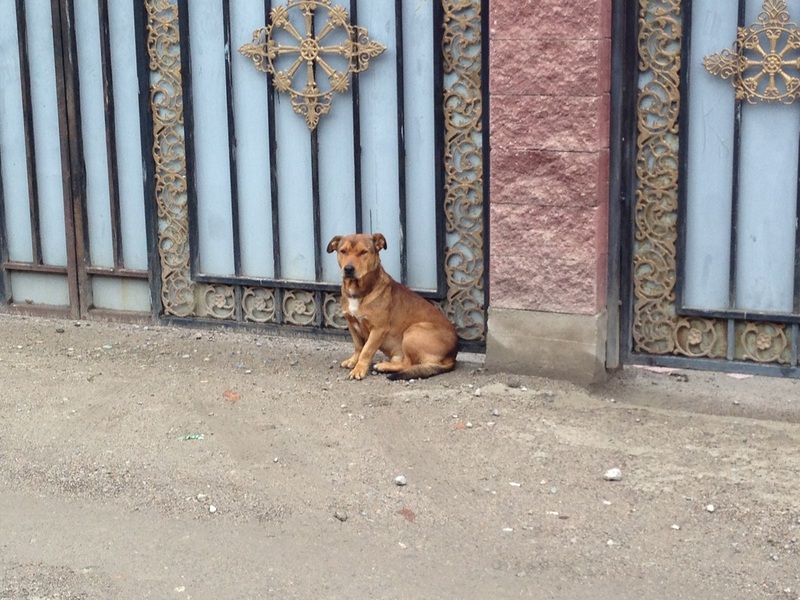 Unlike the vicious packs of wild dogs known elsewhere, Almaty mutts are nothing to be feared. I have a theory, actually, that stray dogs here have evolved for maximum cuteness. They tend to have long bodies and stumpy feet, with a low profile that's non-threatening, and faced with a wandering cameraman they don't bare their teeth but pause nervously for a photo and then skitter away. 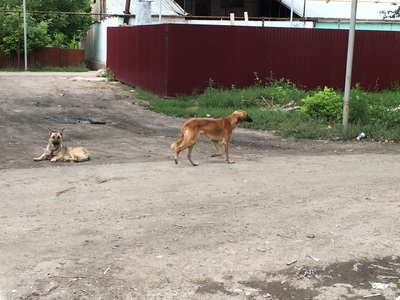 Even when I've seen packs of dogs, up to six or seven, they seem to collectively fear my human presence, not challenge it. Maybe they've been whacked too many times by cruel schoolkids. 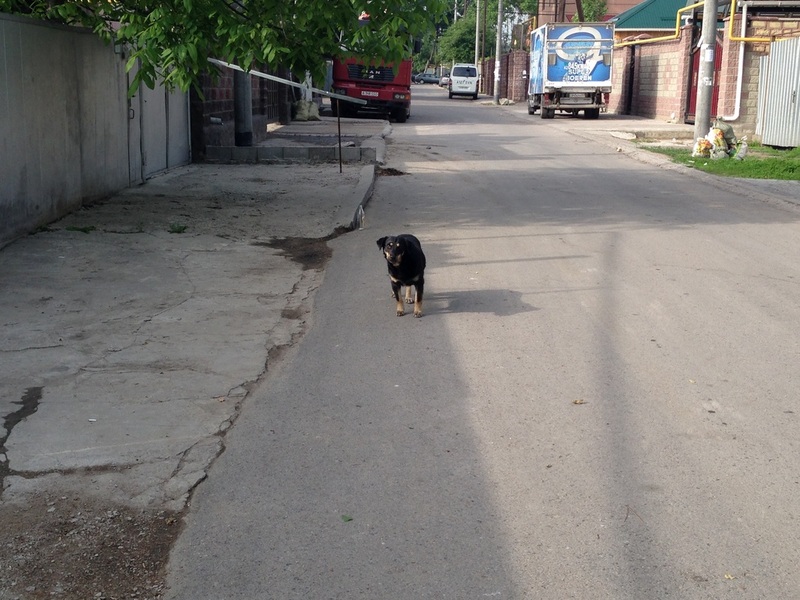 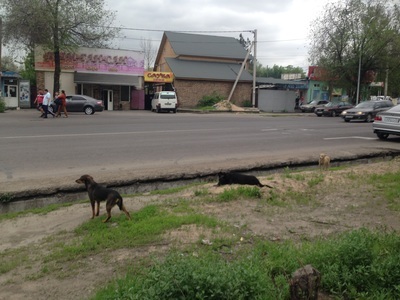 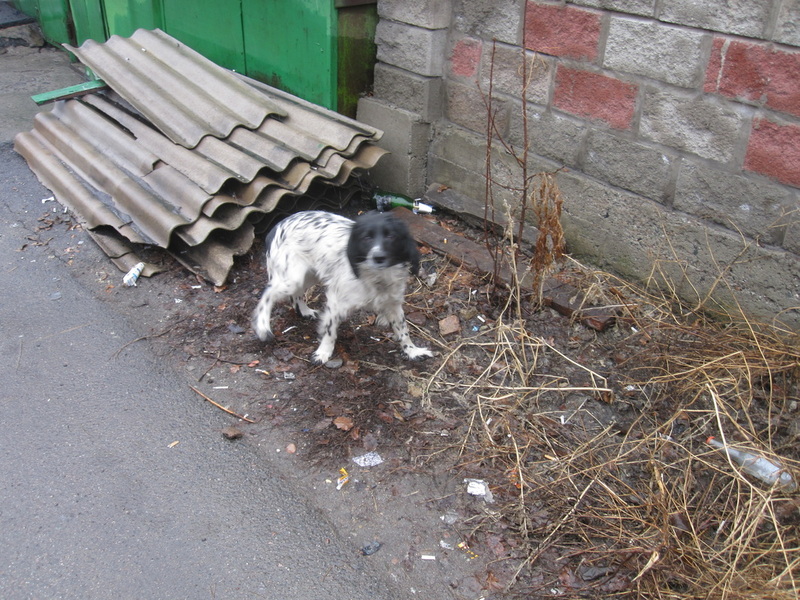 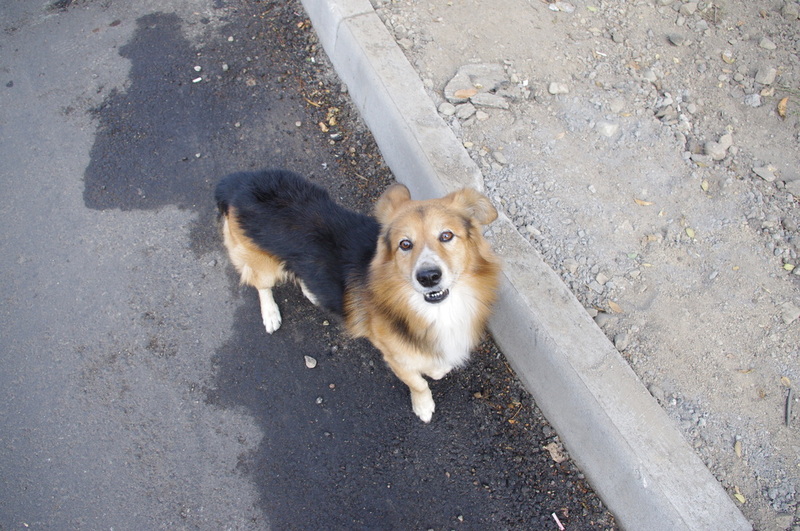 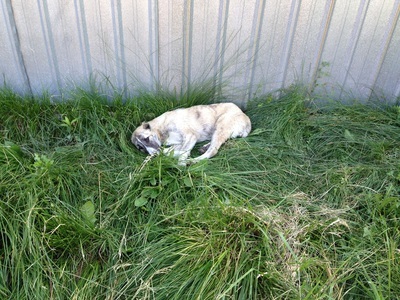 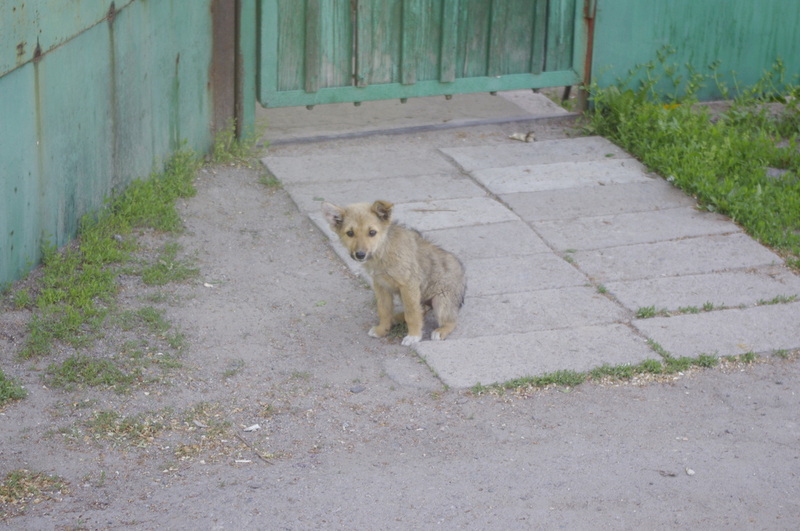 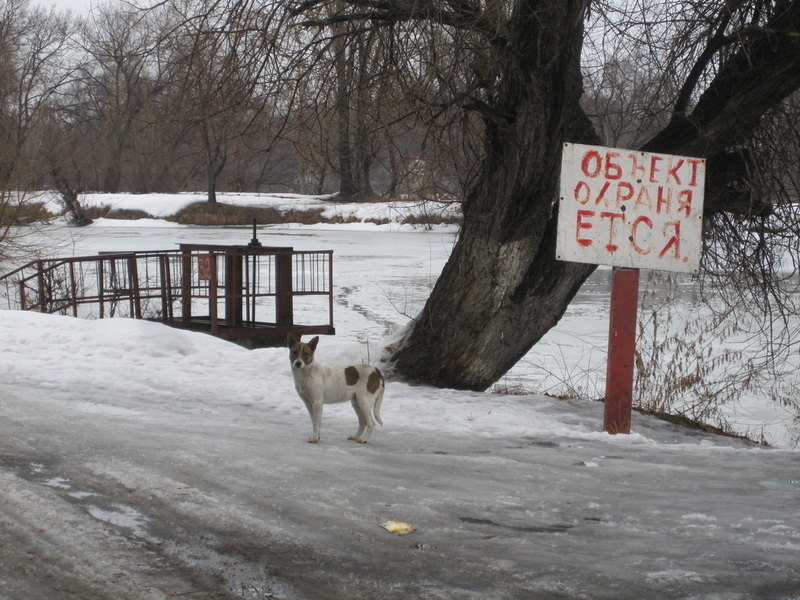 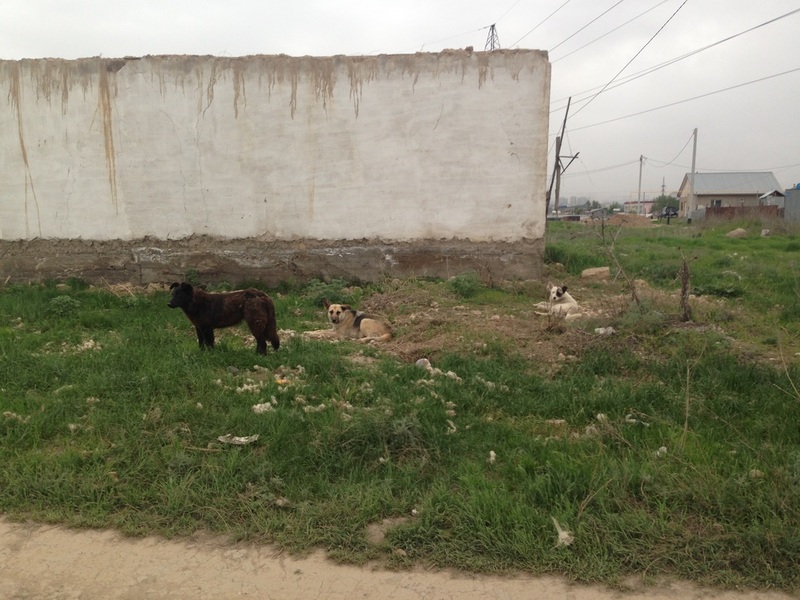 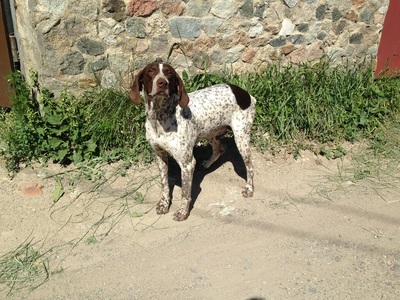 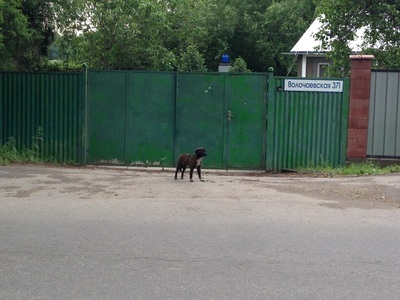 Or maybe they've heard that over the border in Bishkek, dogs get rounded up by the thousands and shot in the head. In any case, it's the growling guard dogs, poking their noses out from under metal fences, that cause more concern. 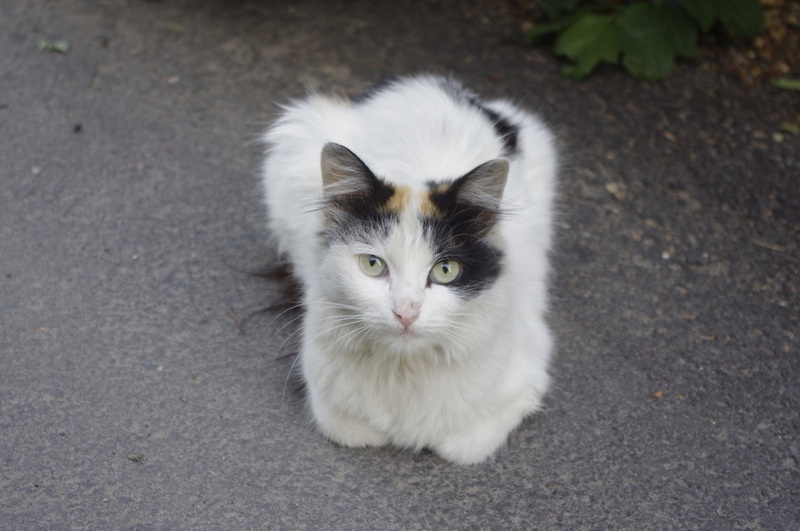 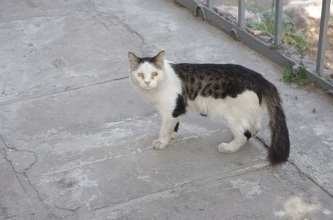 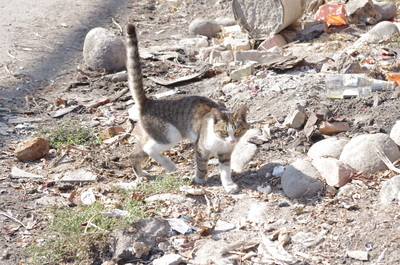 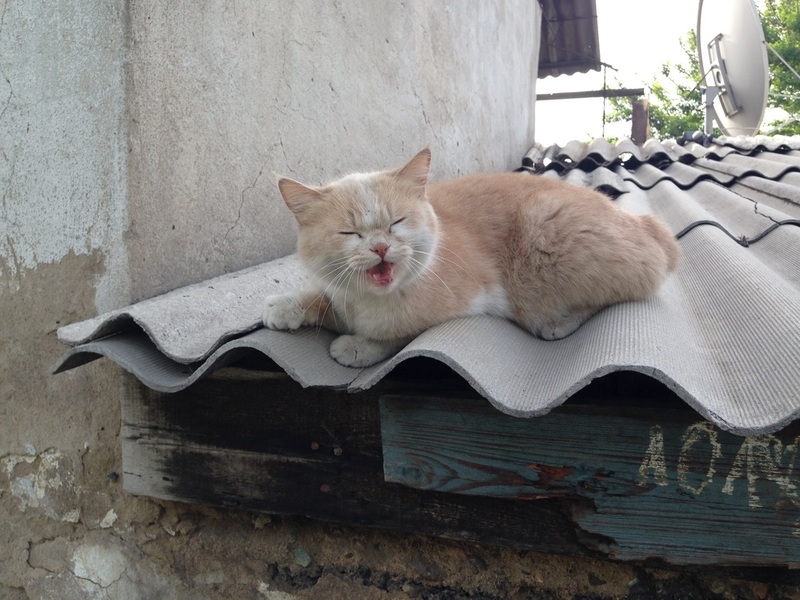 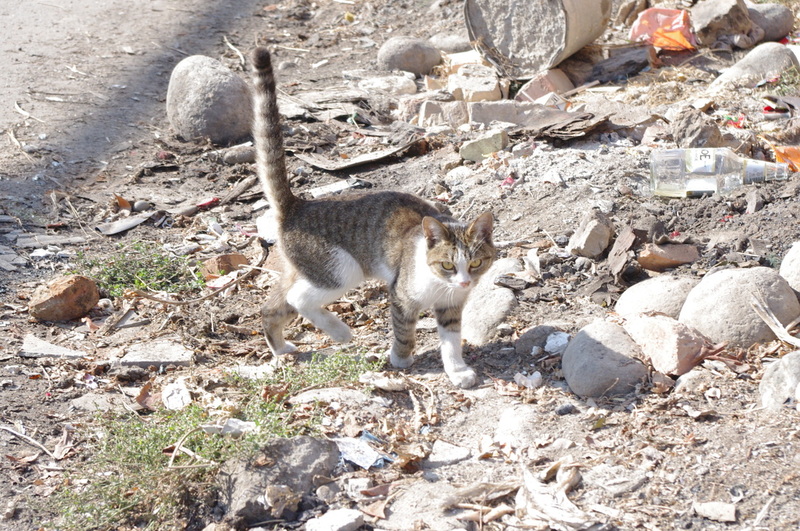 Street cats are harder to discern because any old house cat, given some freedom to explore, can cruise the neighborhoods and look homeless. 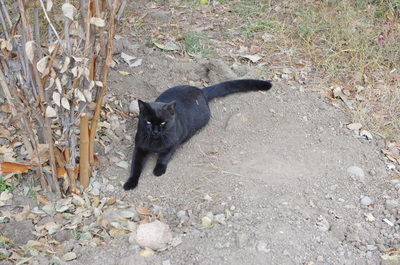 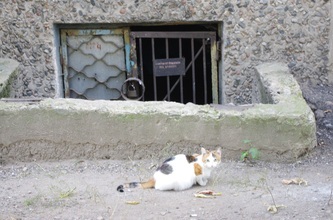 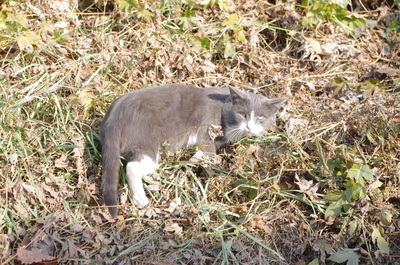 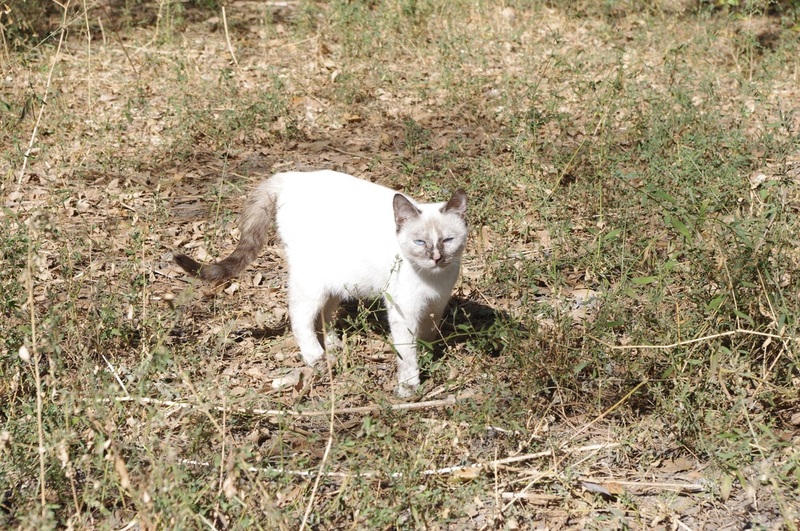 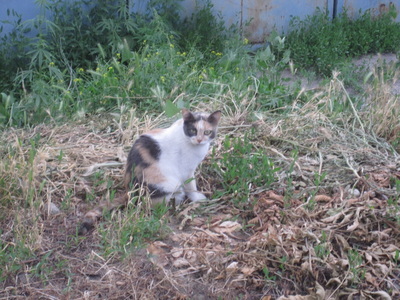 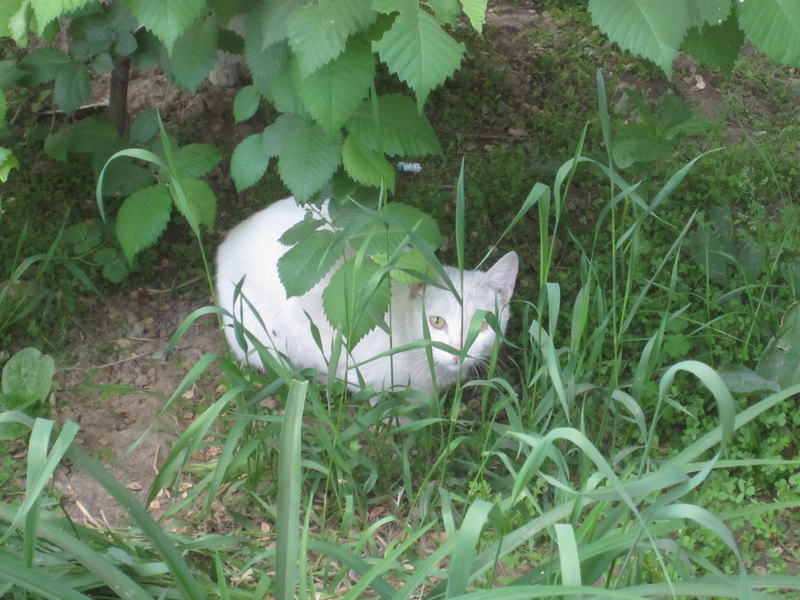 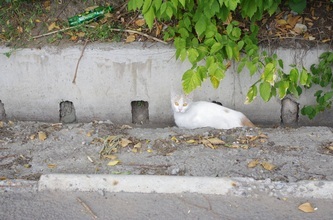 In the dense downtown it's more obvious, because few apartment dwellers are going to let their cat out onto the busy streets, and the stray cats that you do see tend to be outwardly wild, doing the jungle cat crawl and hiding in bushes. 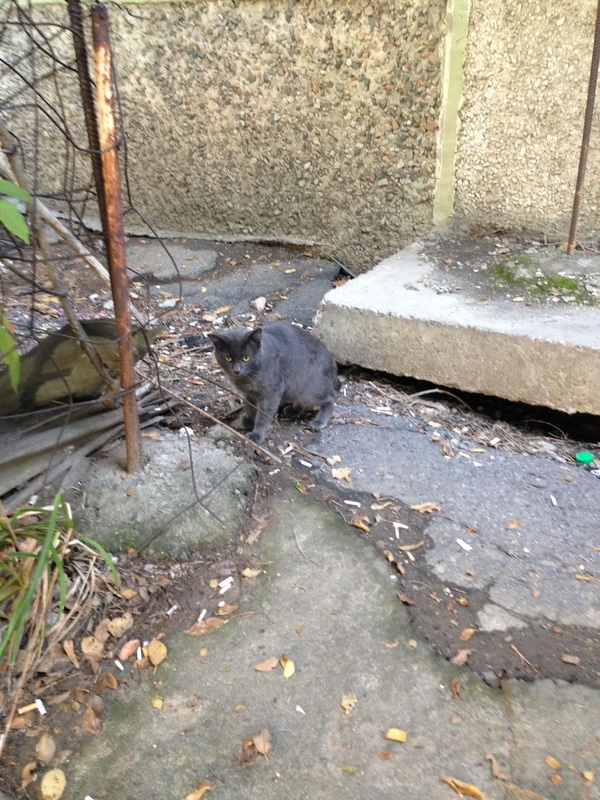 Seeing a filthy kitten is especially heartbreaking, but people like to give leave these cats food in the courtyards and sometimes take them in, so hope is not lost. 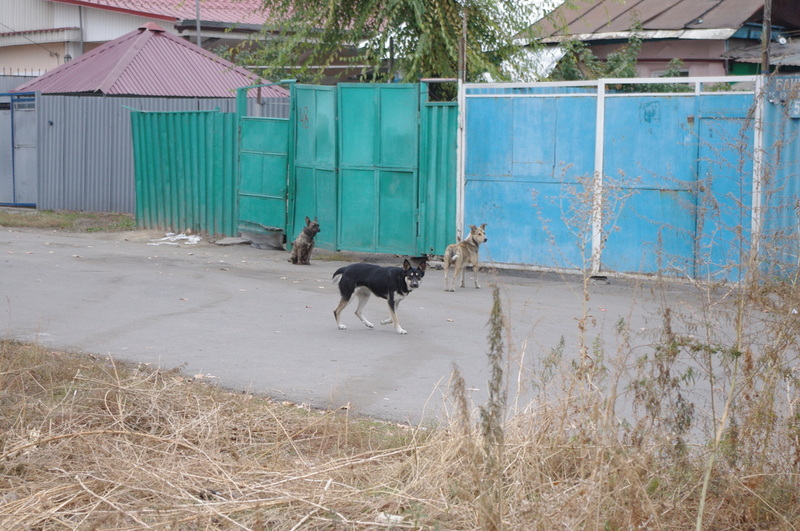 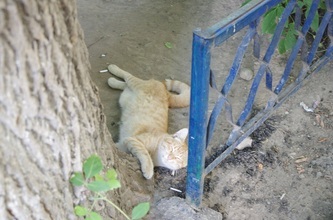 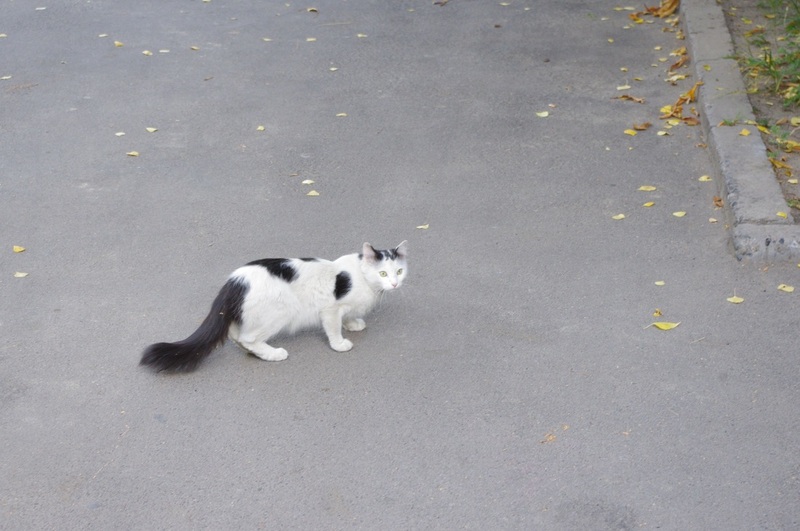 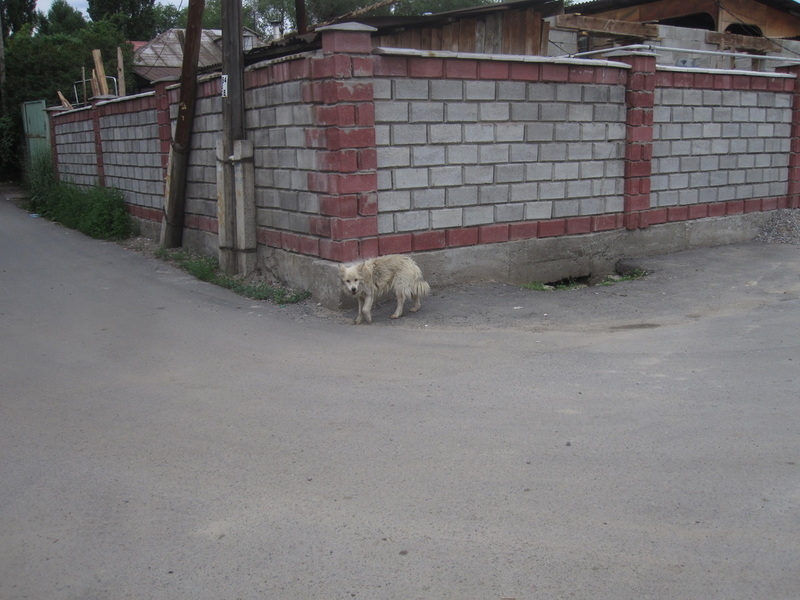 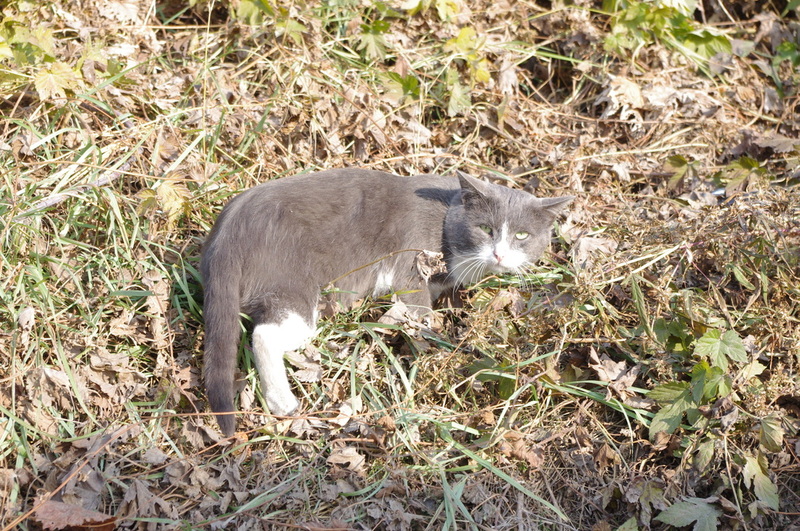 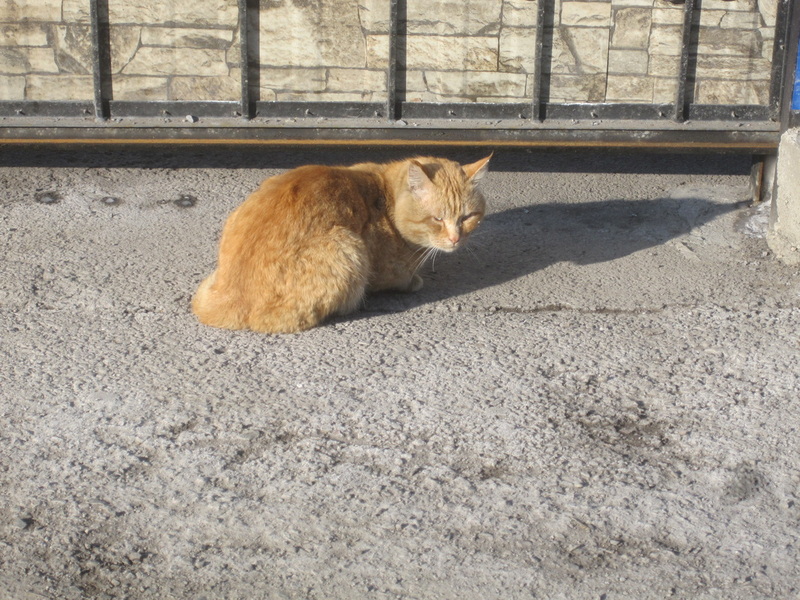 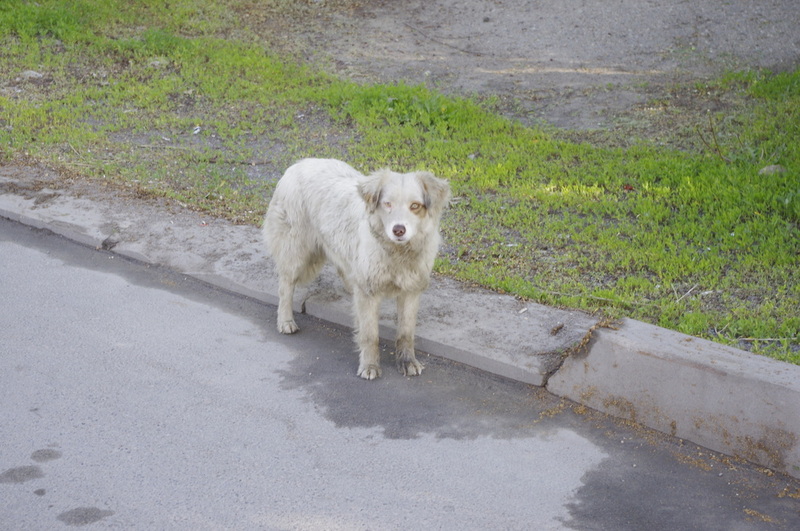 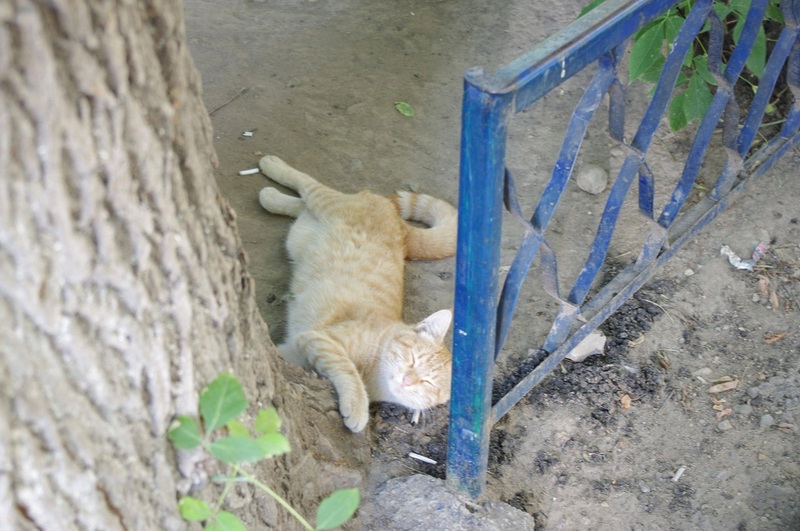 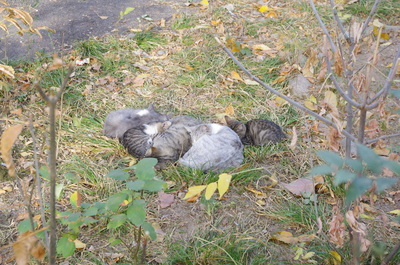 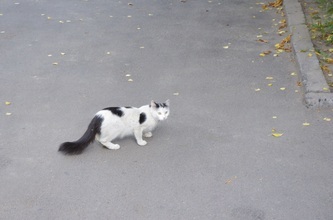 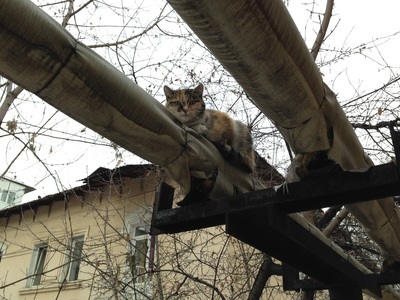 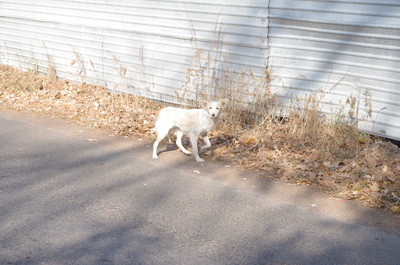 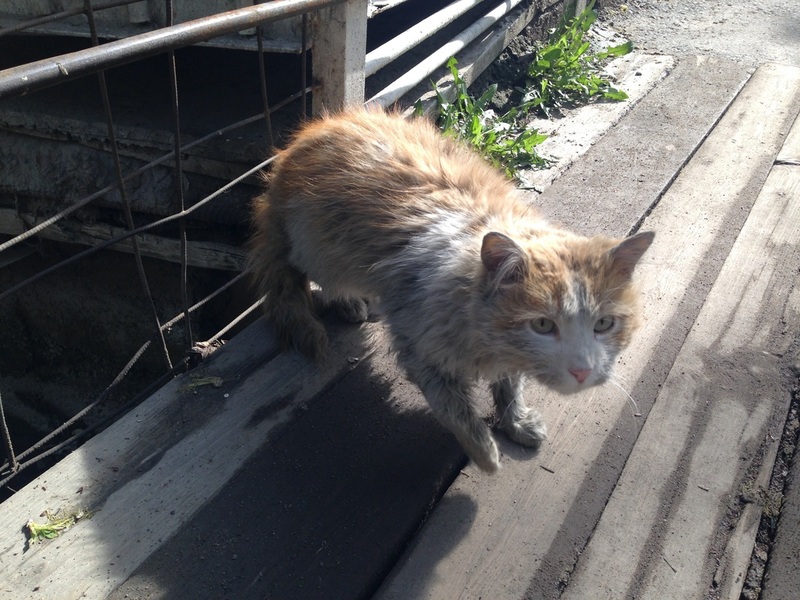 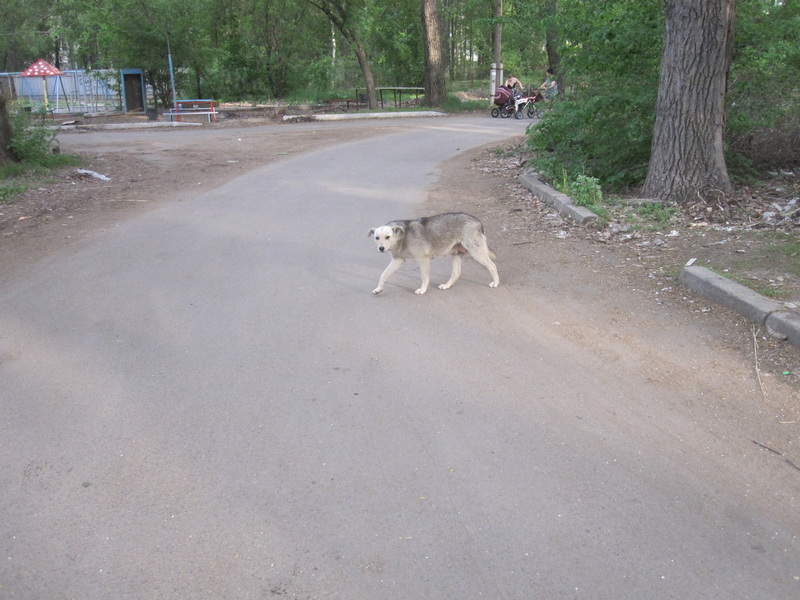 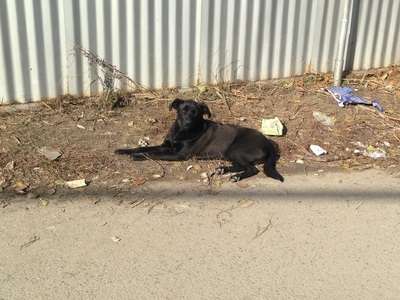 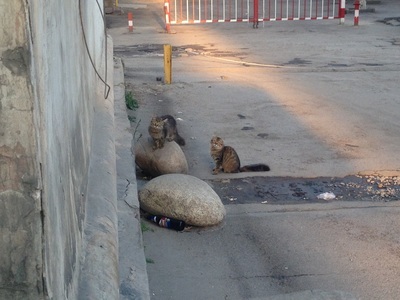 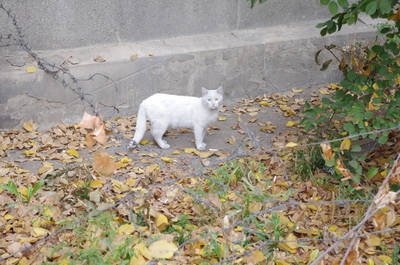 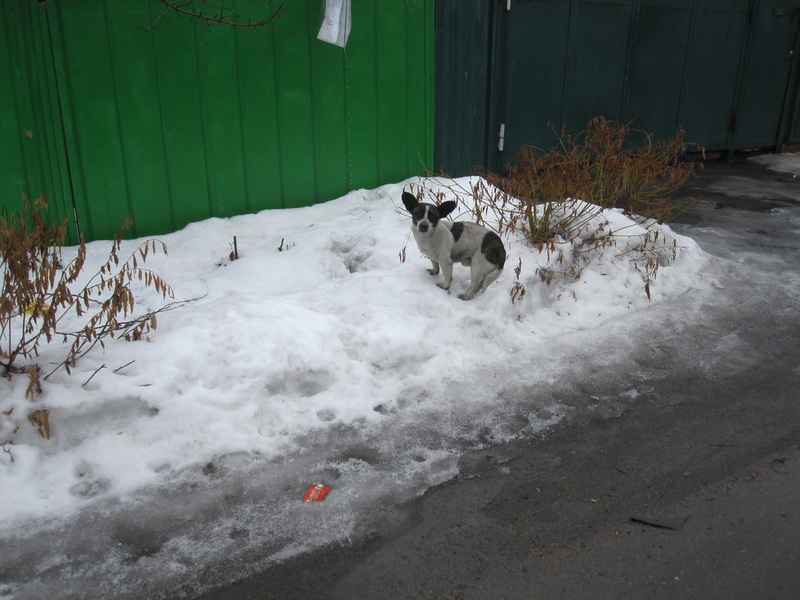 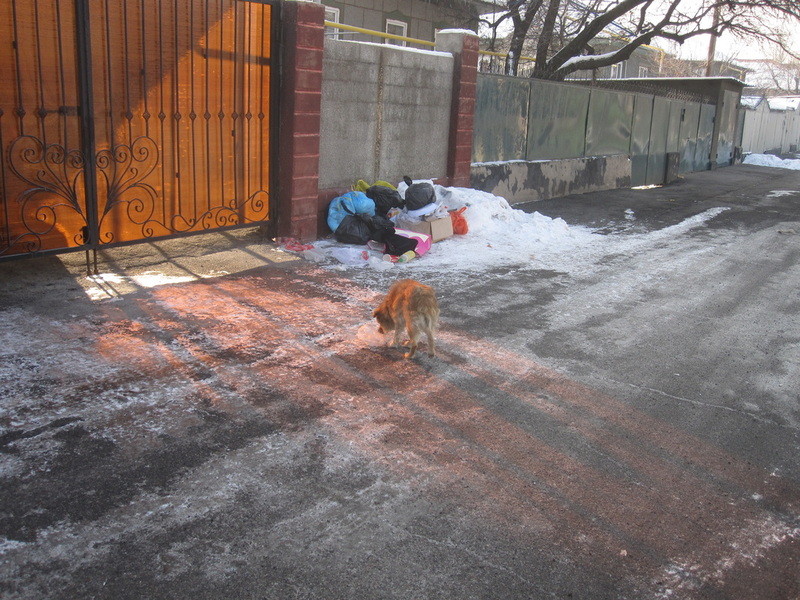 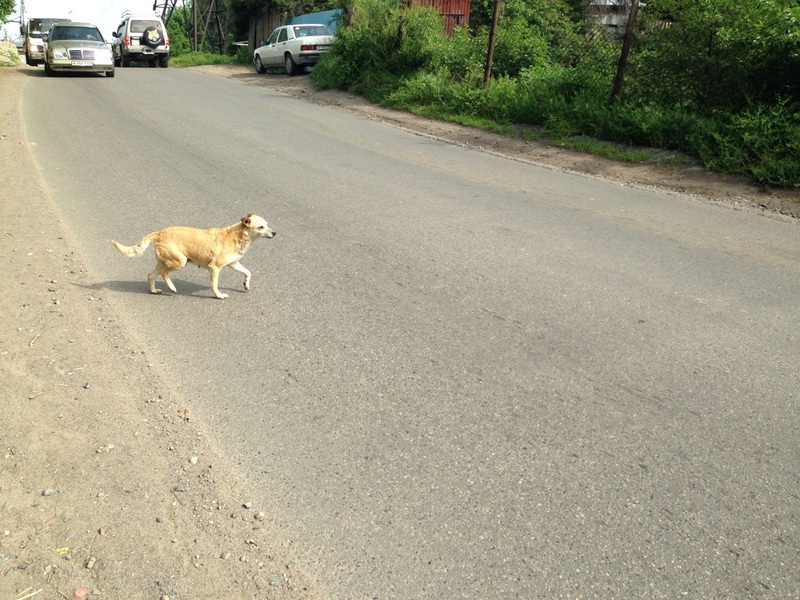 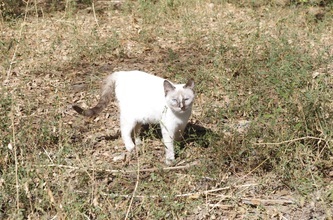 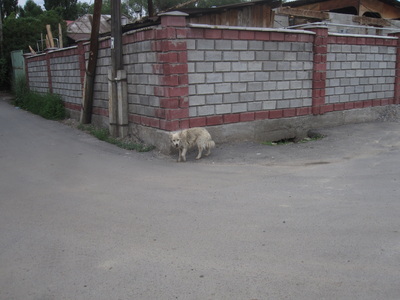 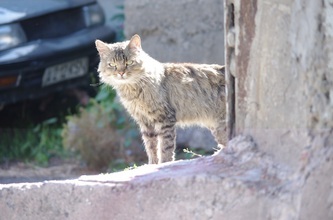 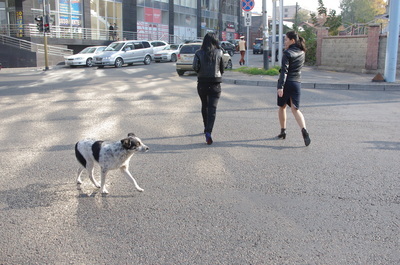 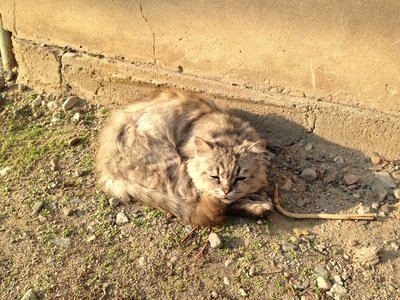 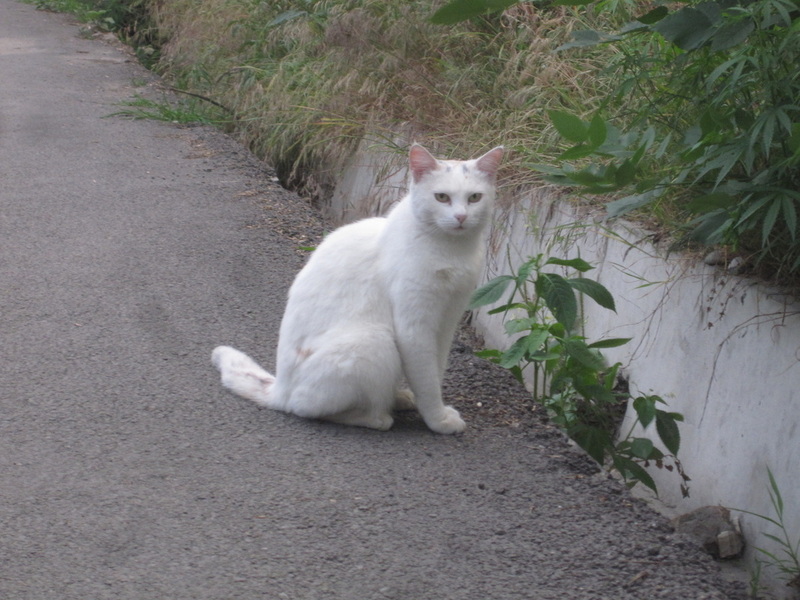 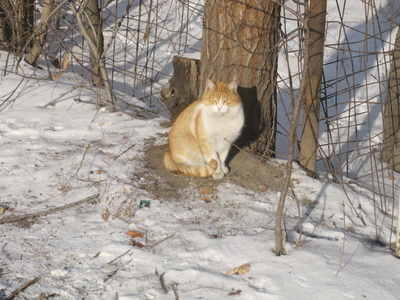 Every time I've seen a loose dog or cat on my walks, I've taken a picture, and I dare brag that this may be the largest ever photographic census of Almaty's stray community. 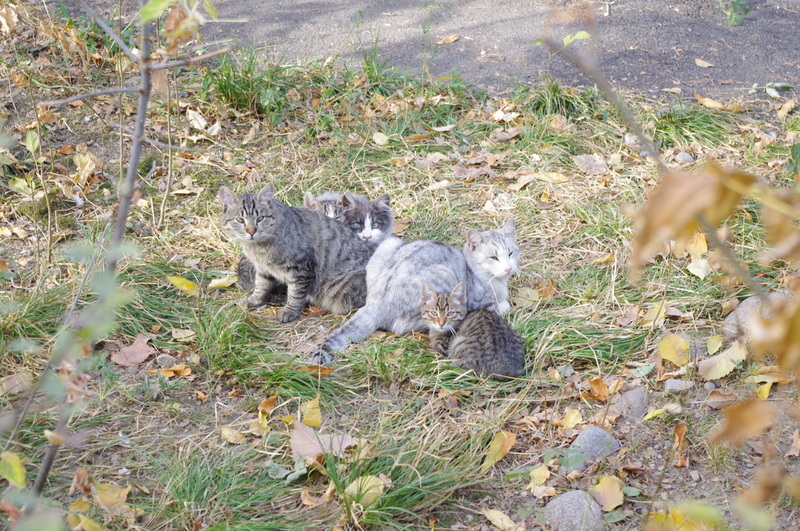 It's sad, really, how they all look right into the camera. 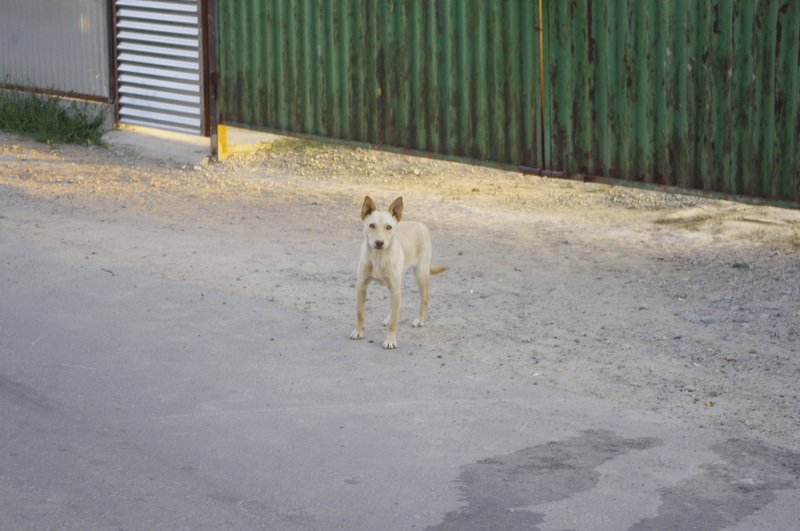 Like the proverbial deer in headlights, they become consumed by fear. It doesn't feel good to be the presence that incites such anxiety, yet I do my best to pass on some good cheer, calling them sweet names and wishing them luck.